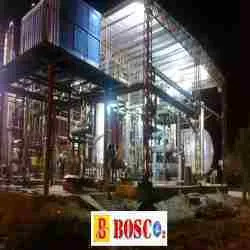 Bosco India, an ISO 9001:2008 company established in 2002 has emerged as a leading manufacturer, exporter and supplier of CO2 Recovery and Production Plant. We are renowned for our wide range of products which include Co2 Recovery Plant, Co2 Generation Plant and Co2 Storage Plant. Our products are known for their excellent performance, high efficiency, low maintenance and high yield. We offer the most efficient products at very competitive prices to industries like beverage, chemical, pharmaceutical. Moreover, we are also engaged in offering Annual Maintenance and Spare Parts services to our clients. Our ethical business practices and customer-centric approach has won us accolades from our esteemed clientele across the globe except Europe. With state-of-the-art facilities and dedicated professionals, we are poised to deliver international standard quality products at the most affordable rates. Comprising of various sub-functional departments like manufacturing, engineering, quality management, research & development, sales & marketing, our infrastructure sprawls over a large geographical area. Our adept specialists, skilled engineers, efficient work force and matchless resources enable us to serve the demands of various sectors with quality solutions. We make sure that our offered range goes through a stringent quality check process after it is manufactured. Moreover, our competitive prices, prompt services, wide distribution channel and on time delivery schedules has given us a competitive edge in the market. Our company is constantly progressing under the leadership of our CEO Mr. Sanjib Kumar, who has always encouraged new ideas of manufacturing to offer better quality of products to our clients. Being highly experienced in this domain, he is the ultimate source of inspiration for our team. We have constructed a sophisticated infrastructure faculty that is integrated with several sub functional units such as manufacturing, quality testing, warehouse & packaging and research & development, etc. Spread over a wide geographical area, these units are outfitted with advance technologies and machines that help us to manufacture the superior quality products. Our infrastructure supports us in meriting bulk & urgent requirements of clients in timely and efficient way. Further, we upgrade our infrastructure on regular basis in tune with latest technological development. 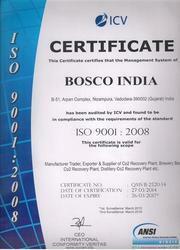 We are ISO 9001 :2008 Company & as a quality centric organization, the prime focus of our company is to manufacture, export and supply the excellent quality products to our clients. Our offered range is manufactured utilizing premium quality raw material and advance technology under the strict supervision of our experienced professionals. Also, our procuring agents help us source the finest quality raw material from the certified vendors of the industry. In addition, to this, our offered range is stringently checked on varied parameters by our quality controllers so that only flawless products can be delivered at clients’ end. Foam Trap (Separator) – To remove occasional foam carryover from fermentation. CO2 Booster Compressor – maintains fermenter pressure and provides positive pressure for purification and compression. CO2 Scrubber – provides bulk removal of water-soluble impurities (such as alcohols, ketones, etc.) in an efficient manner using potable water as the scrubbing medium (minimal water consumption). CO2 Compressor – elevates the CO2 gas pressure to allow for efficient purification, dehydration and liquefaction. CO2 Aftercooler / Precooler – reduces the gas temperature to condense and remove a significant amount of water contained in the gas. This maximizes downstream equipment performance and efficiency. CO2 Deodorizer / Dryer – provides final trace removal of impurities (such as organic and sulfur compounds) and water vapor (moisture). Liquid CO2 Storage Tank – receives and stores the liquid CO2 for reuse or resale. We are empowered by a dexterous team of professionals that have strong business insight and possess vast experience in this domain. They are dedicated towards the growth of organization and work in close tandem with clients to cater to their variegated needs. Moreover, the team of technocrats in our organization makes their sincere efforts in order to develop our products in accordance to the set international standards. Owing to their expertise and dedication, we have positioned ourselves as the prominent organizations in this domain. With great pleasure, we are introducing ourselves as the distinguished manufacturer, exporter and supplier of a comprehensive range of CO2 Recovery and Regeneration Plant. Our entire range is manufactured as per the set international norms.